I'm nearing the end of the 29th week of my pregnancy, and I can already feel a marked change in my energy level. In my second trimester, I was full of energy and motivation. Now? I'm back to feeling exhausted pretty much all day long... And, now that I'm working outside of the house on a full-time basis again, I feel guilty about feeling tired. I can battle through the need to nap at work to get my job done -- thankfully, I'm always busy at the office - but I can hardly keep my eyes open when I get home. This past week has been especially difficult because Stephen's been traveling for work, and I'm looking forward to having him home again in a few days. Despite having a full to-do list, I allowed myself to sleep in this morning. When I finally got out of bed and took care of the dog, I didn't jump to work right away. 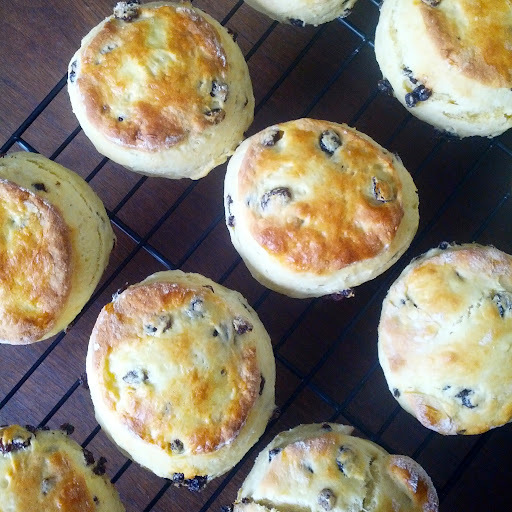 Instead, I spent some time in the kitchen baking scones. I needed me time... to focus on something I love without the guilt. And I'm awfully glad I gave myself a little break... because the scones were so delicious! I've already eaten two of them! The day is getting away from me now, so I think it's time I shift my focus to that to-do list, including blogging about our menu plan. Keep reading to see what's on deck for dinner for us this week! What's for dinner at YOUR house this week? Let me know in the comments below!